Post Modern Romantic Artist David SchwARTZ presents "I WANT YOU to Honor a Hero, Hire a Vet!" Our U.S. veterans know first hand the sacrifices they have made to ensure the security, peace and freedoms we enjoy as Americans. Since September 11, 2001, thousands of men and women have put their personal lives on hold to serve on the front lines of duty in more than 150 countries throughout the world. Now, they are returning home where they face their next challenge: attempting to rejoin the American workforce to help rebuild our nation?s economy. Many veterans are finding it difficult to obtain gainful employment. CallSource, the National Apartment Association and its 165 state and local affiliates have agreed to jointly train and promote the hiring of Veterans in the Multifamily Housing Industry. PrideAmerica.org and Hire a Hero are working to identify and train veterans--at no charge--using CallSource technology, content and mentors from CallSource and the industry. 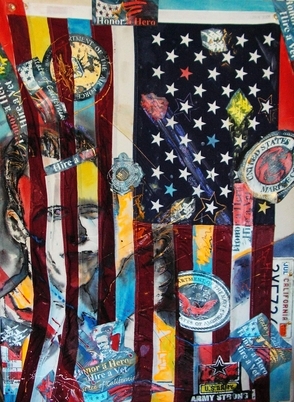 I am also delighted to partner with a special artist, David Schwartz, to help raise public awareness of the need for companies to hire our Heroes! Join us by starting a conversation at your workplace. We can help employers identify talented candidates who are trained through the CallSource Platform and ready to engage in the battle to make the U.S number one again! Welcoming home our heroes is a team effort on the part of private industry, higher education, the government and yes, even our artists who join me in standing behind our troops 100 percent with our commitment to Honor a Hero, Hire a Vet! Sign up today to host the official artwork at your business and to learn how you can provide jobs and training to the veterans you hire. can Host the ARTZ and Support our Veterans! the sale of "Honor a Hero, Hire a Vet!" support U.S. VETS, The Gold Coast Veterans Foundation & PrideAmerica. May the SchwARTZ be with you! Call (805) 984-2816 to order your SchwARTZ original or print!